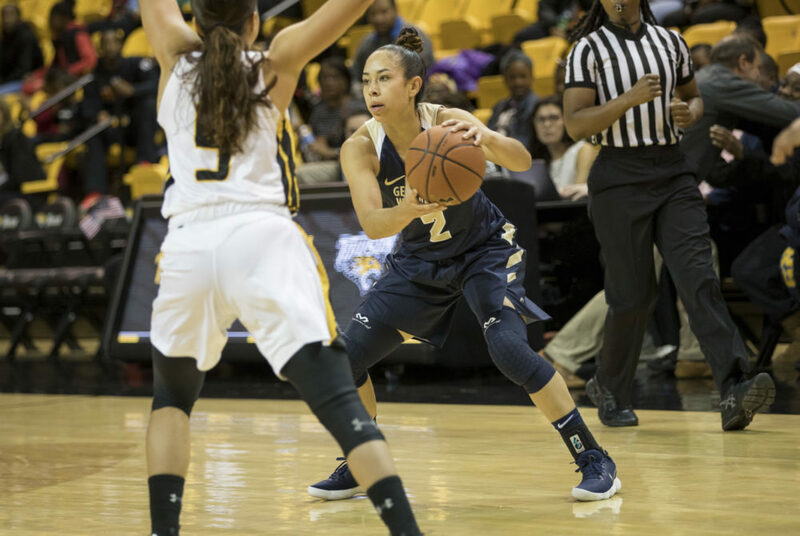 Senior guard Camila Tapias looks for an open teammate during a women's basketball game against Towson in November. After dropping its conference opener, women’s basketball came back ready to play. This past weekend was the first time in five years that the Colonials started Atlantic 10 action with a loss, but that only seemed to fuel their motivation when they returned to the court to take on the VCU Rams Wednesday. The Colonials (6-8, 1-1 A-10) dominated against the Rams (4-5, 0-2 A-10) after snagging an early lead and forcing a season-high 27 turnovers in their 61–39 victory at Richmond. GW gained momentum early on in the contest, securing a 12-point advantage in the first quarter and only continuing to widen the gap as the half continued. The Colonials started off the first quarter on a 10-0 run. GW held onto that lead to end with a 19-7 advantage after only 10 minutes of play, setting the tone for the rest of the game. Senior forward Kelli Prange made her return to the court Wednesday after sitting out the last six games due to a concussion. Prange, who before this game had led GW in scoring during four of her first seven outings this season, proved to be an asset to the team during the first half. Prange only played six minutes in the contest, but finished with two points, two rebounds and a steal. Rizzotti said having Prange back in the lineup will make a difference for the team. “We will continue to work to get Prange up to her normal amount of time in order to do well when facing harder teams,” Rizzotti said. The Colonials maintained a 100 percent free throw percentage throughout the first half. By halftime, the Colonials led by 27 points. Senior forward Kelsi Mahoney and freshman forward Neila Luma were leading the scoreboard at the half with 13 points each. Despite the strong start, GW began to lose their momentum at the beginning of the second half. But the Colonials were still able to lead for all but 36 seconds of game. The players’ energy dwindled after missing the first couple shots of the third quarter. The three-point percentage dropped 40 percent in the second half, while the field goal percentage dropped about 30 percent. The Rams took advantage of the Colonials’ drop in energy, scoring six points within the first six minutes of the third quarter. Despite the drop in focus that had fueled the team in the first half, the Colonials never trailed. Senior guard Brianna Cummings stepped up to score eight of her total 14 points in the second half, while freshmen forward Chyna Latimer and guard Lexus Levy came off the bench to score two points each after halftime. Then the Colonials returned in the fourth quarter with the energy that they brought in the first. Mahoney sinked a three-pointer in the first six minutes of action, setting the Colonials up for a successful offense and a 30-point advantage, their largest lead of the season. Mahoney was GW’s top scorer on the night, securing four points in the second half and a career-high total of 17 points in the game. The Colonials return to action Sunday to face off against George Mason at home. Tip-off is slated for 6:00 p.m.